Most gaming clans use VoIP software to communicate in game, one of the most popular applications for this is Teamspeak. Starting in Teamspeak 3.0, a text-to-speech engine is included to provide notifications of players entering and leaving channels (among other things). By default, Teamspeak will try to pronounce your nickname, not always a good thing when the nickname contains your rank (e.g. “|sgt| mtekk”, we want everyone to hear just “mtekk”) as the engine pronounces “|” as “vertical line”. In Windows and OS X you can use “Set Phonetic Nickname” under the “Self” menu. In Linux, the prompt will open, but the text box is disabled. This is due to a text-to-speech engine not shipping with the Linux version of Teamspeak3. So how do we set the phonetic nickname in Linux? Well, it’s really simple. Go to “Connections > Connect”. In that prompt click the “more” button. You should now see a field that is labeled “Phonetic Nickname”. Alternately, you can dive into the Teamspeak configuration files (like I did). Under your home directory there should be a directory named “.ts3client”, in a terminal you can see it using ls -a ~/. Within .ts3client there should be a file named “ts3clientui_qt.conf” open this up with your favorite text editor (e.g. nano: nano ~/.ts3client/ts3clientui_qt.conf). Scroll down to the bottom of this file, there should be a section named “[Connecting]” the last field should be “LastUsedPhoneticNickname=” just append to this setting your phonetic nickname (e.g. 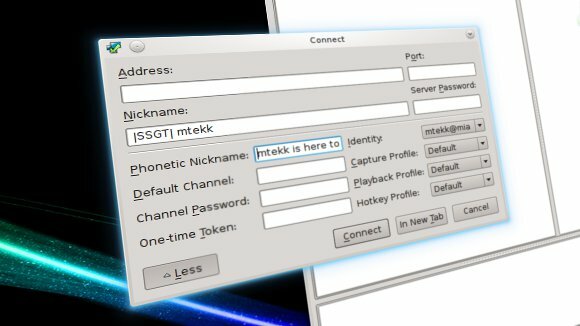 “LastUsedPhoneticNickname=mtekk”). After mtekktux met an untimely demise, one did not have working parts to replace it. Once the new Atom 330 board arrived on Saturday, work commenced on fitting it into the Gateway FLEXATXSTC case of mtekktux. Yes, a little modding took place. The back of the case does not have a standard IO shield hole, so one had to be cut with the trusty Dremel tool. Since this the board is the intel D945GCLF2, it requires the “Pentium 4″ 4 pin 12V connector. Well, the power supply in the case is a 70W ATX power supply, so a molex to P4 connector adapter had to be made. Luckily, the P4 connector from a dead Antec power supply was still around, as was a molex to 2x SATA power adapter. One of the SATA connectors on the adapter was removed, and the P4 connector soldered in the appropriate locations. When trying to close/flip in the disk bracket (flips forward and contains the hard drive bay, 3.5″ bay, and 5.25″ bay), the hard drive hit the ATX power connector, and its bracket hit the memory. So off to another round of modifications. The 3.5” bay needed new holes to accommodate the screw holes for the hard drive (who ever decided that floppy drives and hard drives should have different hole patterns should be punished). The lip of the bracket, which hit the memory, was trimmed back with the Dremel. Now everything fits in the case. There is some external aesthetics related work that needs to be done, but that can wait until the semester is done. Since last night, Gentoo Linux has been installed, well actually it’s Funtoo (the Core 2 stage 3 was used). This is install number six using the handbook method, which seems shorter now than it used to be. At the moment, the internal network functions (samba, hplip, etc) are being installed and configured. Apache is already up and running (with the same USE flags as we use at Weblogs.us). And for the curious, an Atom 330 runs just fine under the GCC “Core 2” profile (in menuconfig for the kernel a similar option was set as well). So this past weekend the new database server was installed (physically) at the data center. On Monday JD installed Gentoo, and then I setup mySQL on it (plus some security things). Last night JD transfered over this blog and another over to the new database server for initial performance testing. Later this week and month, additional blogs hosted by Weblogs.us will be transfered over and performance tweaks will be applied. Hopefully, by June everyone will be on the new database server. At that point, signups for more blogs may be possible. It also looks like we may be reintroducing the Weblogs.us front page that I designed a while back. Right now, the speed increase is apparent on this blog, especially when working in the WordPress dashboard. All those AJAX elements instantaneously load now. Additionally, Spam Karma 2’s administrative section loads much faster than before. There should not be any more of those failed comment submissions due to timeouts now, which is an all around plus. A while back while reading a tutorial by Nick La of N.Design Studio, I thought the concept of what his tutorial covered in Adobe Illustrator was cool. Of course, using Illustrator is not an option when running in a GNU/Linux environment. This is where Inkscape comes into play. Much like the GIMP, Inkscape does not do everything that its Adobe competitor does. Thus, abiding strictly to Nick’s tutorial is impossible, but getting to the same end result is possible. In the coming weeks I will post a supplement to Nick’s tutorial for the use in Inkscape. However, right now I’m introducing the end result of my Inkscape experimentation, Gentoo Blue Wave. This is a 1080p resolution wallpaper that abides to the Tango pallet. This is released under the Creative Commons Attribution-Noncommercial 3.0 License.